Attorney General Jeff Sessions unveiled the charges against members of Cartel Jalisco Nueva Generacion, or CJNG. The cartel is accused of trafficking tons of cocaine, methamphetamine and fentanyl-laced heroin into the U.S. The cartel brings about five tons of cocaine and five tons of methamphetamine into the U.S. from Mexico each month, Sessions said. The 15 indictments charge a total of 45 of the cartel’s leaders, financiers, transporters and suppliers. 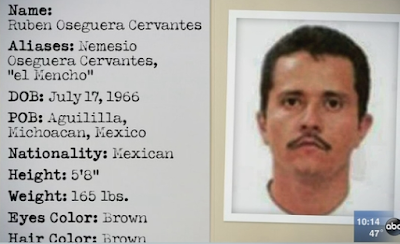 Nemesio Oseguera Cervantes, 'El Mencho,' is charged in three of the indictments but remains a fugitive. 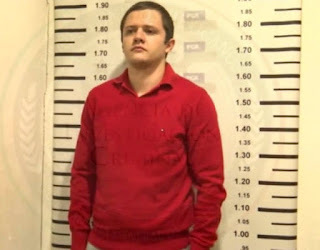 The U.S. is offering a $10 million reward for information leading to his arrest. El Mencho's son, Ruben Oseguera Gonzalez, is also charged in two of the indictments. 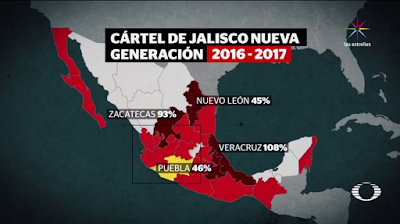 Officials believe the cartel has influence in 75 per cent of Mexican states. The cartel also operates across the U.S., and in Europe, Asia and Australia.